Perfect website for all the ports on the intake. I didn't find too much on Nico with pictures of the manifold, but this shows a lot of the naked parts of the CA18. Maybe add this to the FAQ if one of you more knowledgeable guys run through it and see if this guy's diagrams check out. Helped me out with learning which gold canister is the FPR (I know, newb :p) to hook my boost controller to. No need to, but thanks. Your post alone will help someone using the search function find that saite. I don't care for the background as it hurt my eyes, but would be useful in helping noobs figure out their dilemmas with hoses and such which is really not that hard (for me anyway) to begin with. holy isht! that backround is brain melting! I'm making the diagram on this site in case the other one from the link closes down. An admin can feel free to move this post into my original one for easier access when looking at this thread. All credit towards a random stranger Jason Borowiec. #3. 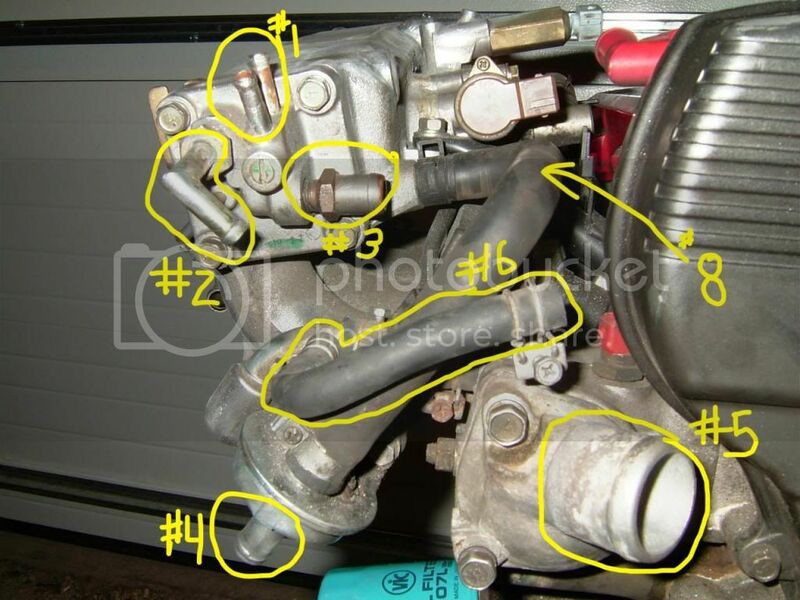 Turbo Coolant feed, this goes to the left, and connects in the center again, directly opposite the oil feed #1, hidden behind turbo. #4. not pictured, Turbo coolant return, this is on top of the turbo cartridge between the compressor and exhaust housings, its directly opposite #2. Its a metal line that runs on the right side of the block bolted to the head. 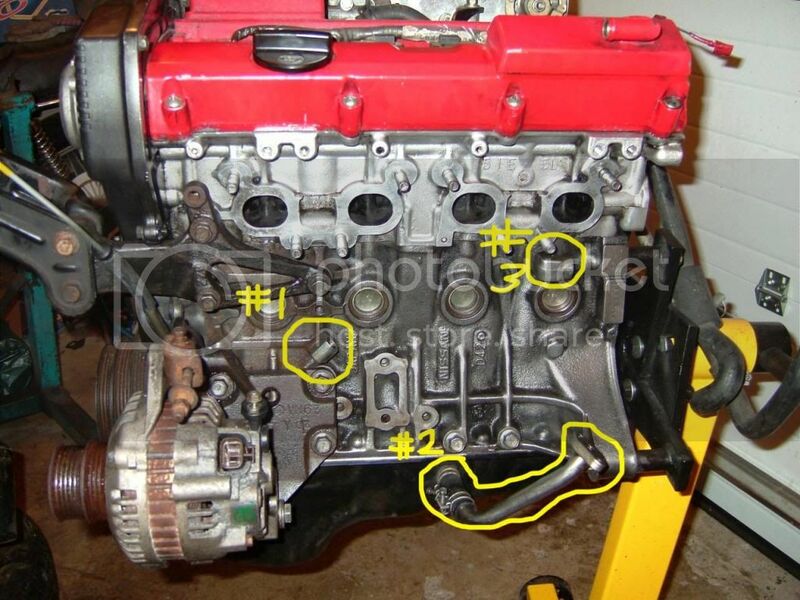 It changes to rubber behind the block and rejoins the flow of coolant into #3 in Figure D.
#1. North Cam cover oil breather, you can either connect this to #3 (if you have emission laws) or put a breather on it, or run a hose and drop it to the ground. #2. Same as #1, this would normally go into the intake piping after the turbo charger, bad idea, run an oil catch can or drop a hose on it and run it to the ground. #3. One way PCV valve , you hook up #1 to this. Put a bolt in there it if you are going to run a pipe to the ground or a breather on #1. #4. Injector grounds. 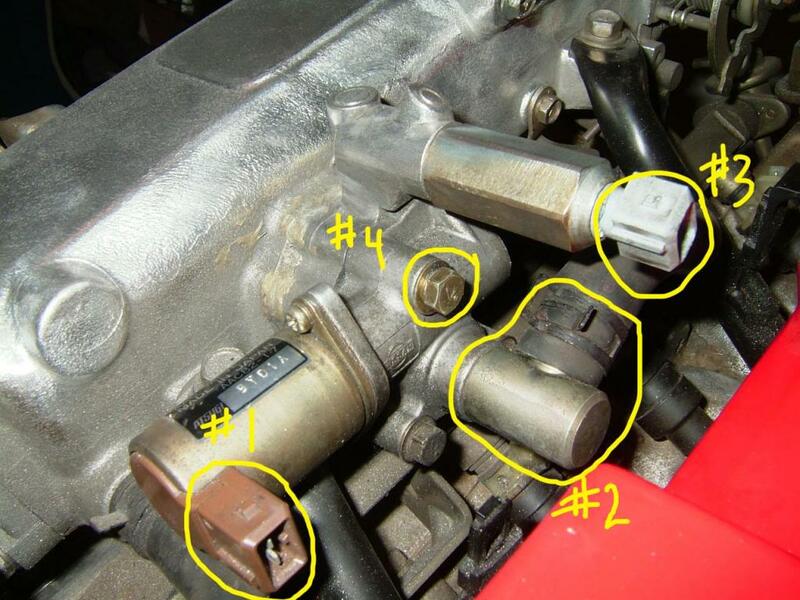 On the engine harness you will have injector plugs, these have 2 ground leads, attach them here. #5. A/C Idle Up Solenoid, it raises the idle of your engine when you turn on your A/C. plug is with the injector plugs on the engine harness. Blue part breaks off easy so be careful. #6. Idle Air Control Valve, this controls idle, don't f*** this thing up. 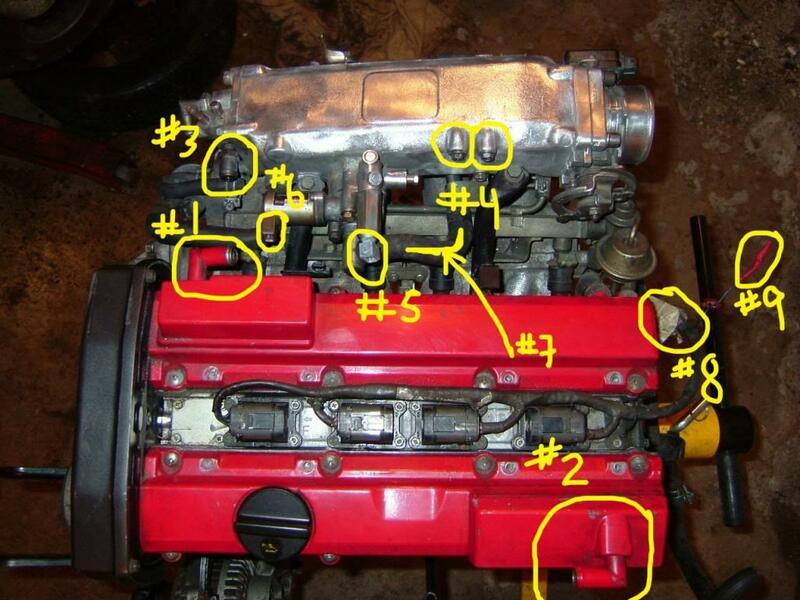 Plug is with the injector plugs on the engine harness. Apparently this goes faulty easy. #9. My engine shouldn't have this disregard. #1 and #7. These are for recirculation of coolant through the back side of the intake plenum. If your not running the car in cold weather, don't hook these up. #2. Break booster vacuum line, run from break booster to here. #3. Mentioned in #3 Figure B above. One way valve, you hook up #1 from Figure B to this. Or plug it. #5. Coolant feed, run your upper rad hose to this. #6. Plug this up. 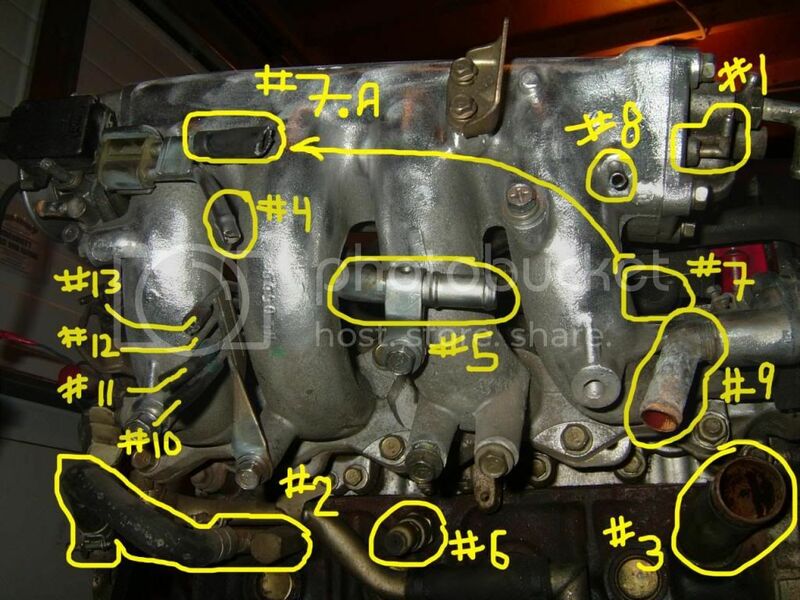 It 'did' connect to the Intake butterfly when the engine was RWD, and did connect to the other side of the intake butterfly. See #3 of Figure F (this is where this line runs) the connects to #14 of Figure F. Not needed. #1. Vacuum line, run boost gauge to this. #2. Run to break booster. #3. Coolant return, this will be explain later. #6. Knock sensor (detonation sensor), this will connect to the engine harness. #7. This is the fuel rail feed line, we will see this in #7 of Figure E (next). #8. Vacuum Line, T this off and run to 2 vacuum solenoids, then each to the the Fuel Pressure Regulator and the Power valve assembly actuator. #1. Vacuum line, send to boost gauge. #2. This is a coolant line, this runs to the heater core on your firewall. Then the other heater line will rejoin the main coolant return that I will show later. #3. Coolant return line, see more of the pipe that brings the coolant here later. #4. Fuel return line, connect your fuel return line that goes under the car. This is fed by the fuel pressure regulator. #6. Knock Sensor, plugs in from engine harness. #7.a Fuel feed line. Connect your fuel line (with fuel filter to this) this then runs to the Fuel rail #7. #9. Coolant line, runs coolant to the block. See #9 from Figure D.
#1. Throttle positioning sensor plug. Engine harness plugs in here. #2. Another part of the TPS plug, plugs into engine harness. #3. 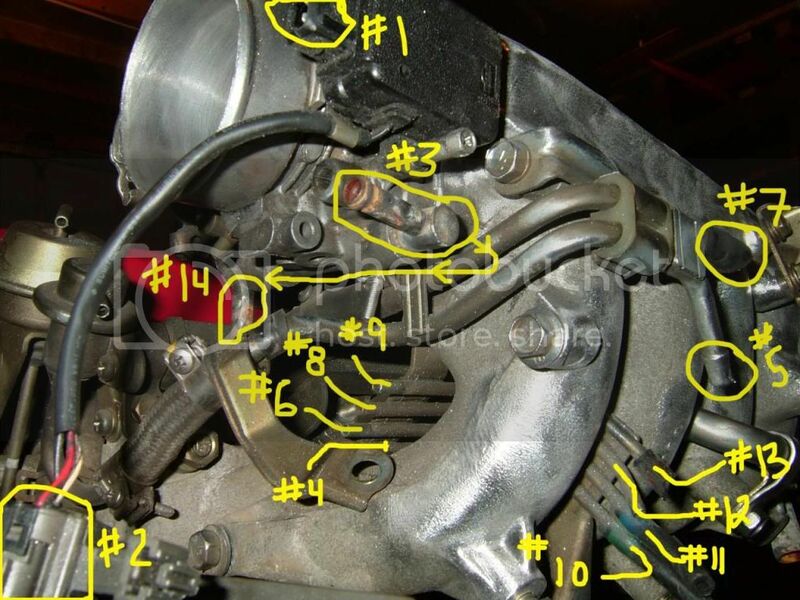 Takes coolant from #6 in Figure C. Then connects to #14 below. Not used plug or let sit. #5. 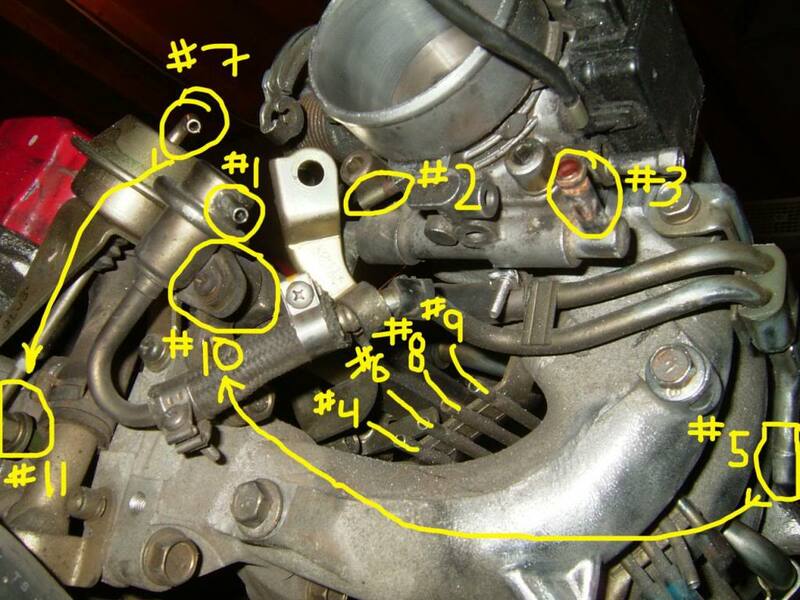 Fuel Return Line, See #4 in Figure E (previous) returns unused fuel to the tank from the fuel pressure regulator. #10, #11, #12 and #13. See #4, #6, #8 and #9. Not used, remove bracket. #14. Coolant is fed to or from this, to or from #3. (from pipe #6 in Figure C.) Not used, plug or leave bare. #1. Vacuum line goes here. Vacuum comes from #8 (T piece) on Figure E to the Pressure regulator control solenoid valve, then to this line. Solenoid also plugs into engine harness. #2. Purge line for charcoal canister. #3. 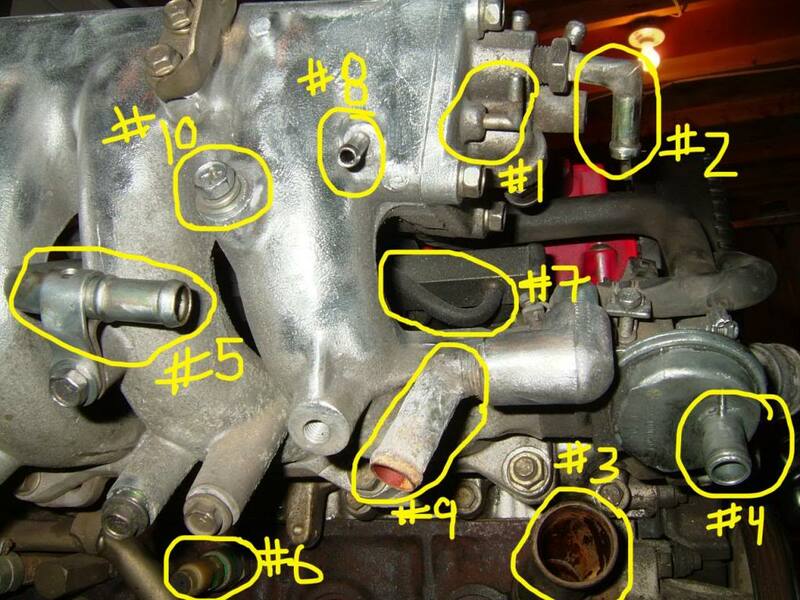 Coolant goes here from #6 in Figure C. (see #3 in Figure F and #6 in Figure C) Not required. Plug it or leave it sit. #4, #6, #8 and #9. another angle of the vacuum pipe redirects from Figure F and E.
#5. 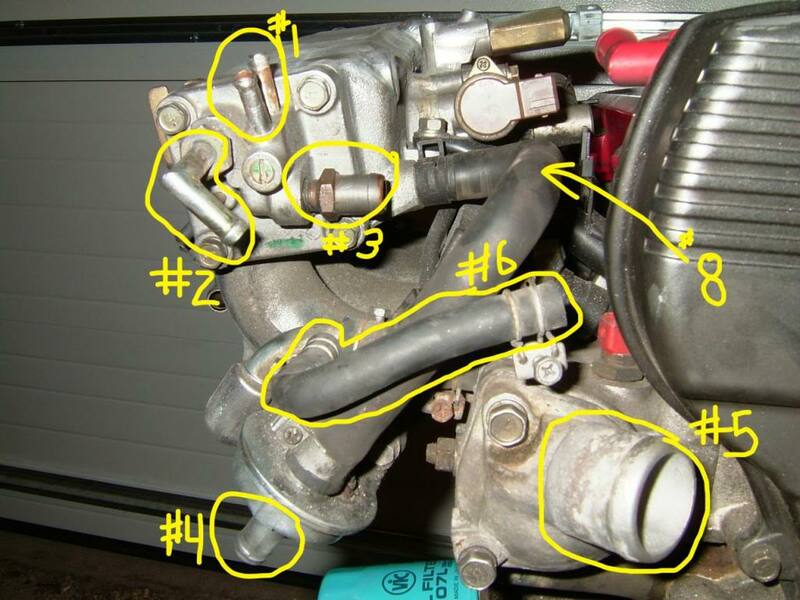 Return fuel line from fuel pressure regulator #1 and #10. #7. Vacuum line goes here. Vacuum comes from #8 on Figure E to the Butterfly Control solenoid, then to the vacuum canister, then to the vacuum delay valve, then to this line. (BCS also plugs into engine harness) open or closes #11. This is a set of butterfly's to open and close to create a larger or smaller intake plenum (internally) This helps you get torque at low rpm. #1. Idle Air Control Valve, this controls idle, don't f*** this thing up. Plug is with the injector plugs on the engine harness. Apparently this goes faulty easy. #2. 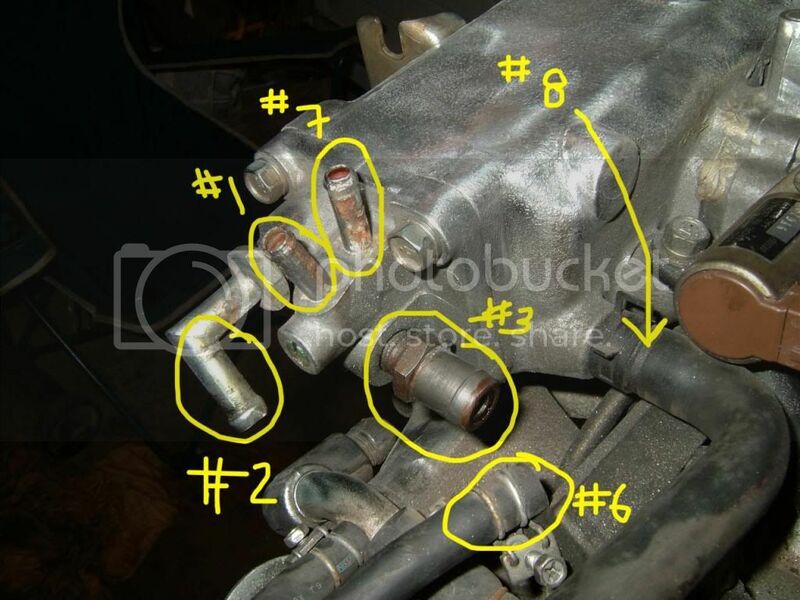 This runs through a gap in the intake and ends up at #5 in Figure E. I think it connects to #4 In Figure C and D.
#3. F.I.C.D Solenoid valve, only used for A/C. Increases idle speed when AC is on. Nice! Thank you! I'll add a link to this thread in the stickies. Going to revive this thread! I remember going to that dudes website last time and well I'm back to where I need to see it again but it's down!! Luckily I found this one but the pictures aren't showing up. Any way we can get this fixed?? Frigging photobucket decided it wants to charge $400/yr for hot linking. We've been telling people to use them for YEARS. Basically 70% of the pics on NICO are all broken now. High Izento, I bookmarked this for later because i'm really going to need this information. Is there a new link yet with the photo's?